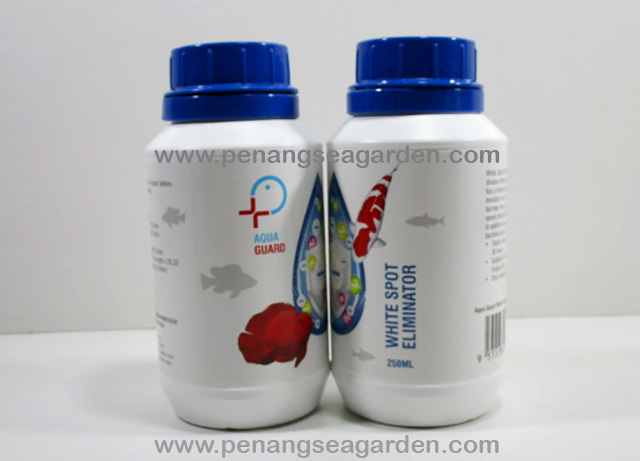 AQUA GUARD White Spot Eliminator treats white spot disease effectively. White spot disease has a multi-staged life cycle, and is invisible in its early stages when it burrows into gill and skin tissue, causing severe electrolyte loss and gill damage in addition to promoting secondary bacterial and/or fungal infections. Treats white spot disease within 36 hours. Suitable for all freshwater tropical fish. Only suitable for ornamental fish. Please change 1/3 of water before medication treatment.